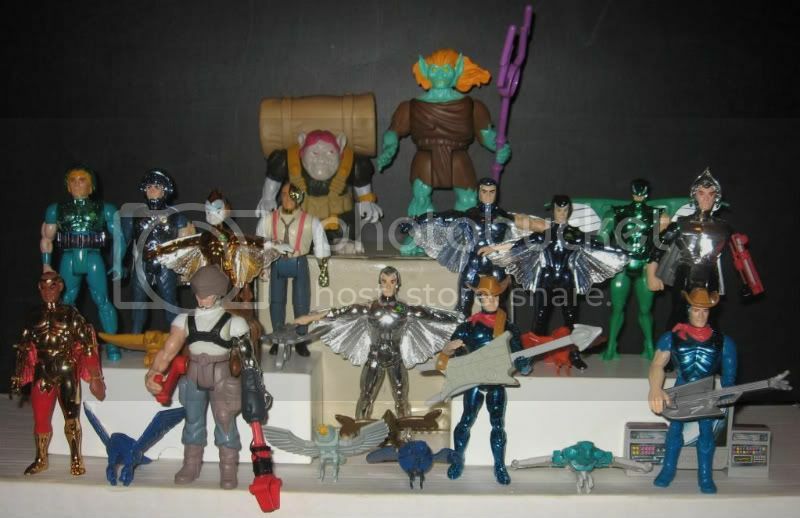 AFB Presents Starman's Toys I Grew Up With: Silverhawks! 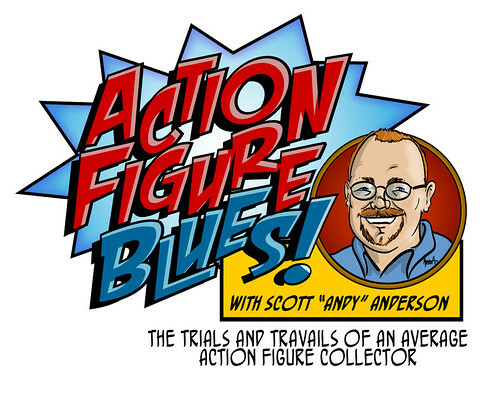 Once again, our friend Starman has some great pieces of toy history to share with us in his monthly AFB guest feature! Over to Stars! 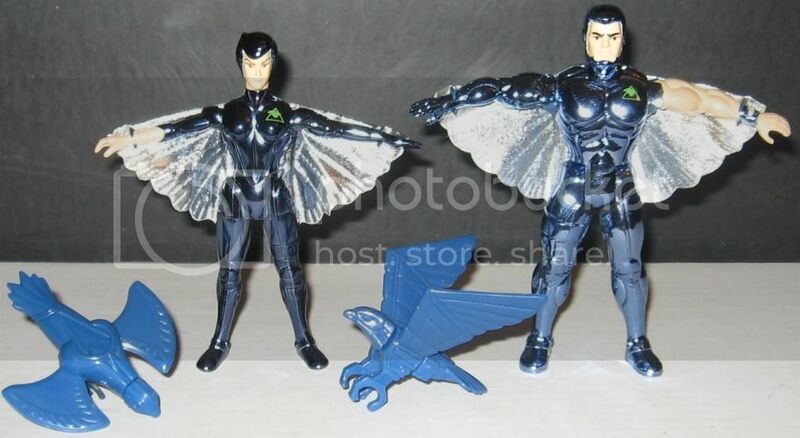 Next up on the Toys I Grew Up With Menu is Silverhawks! 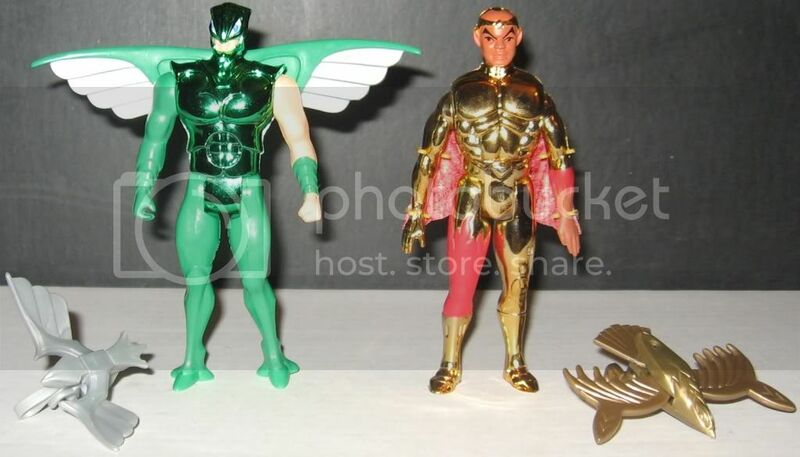 The Silverhawks cartoon was made by the same animation company that brought us Thundercats, but while the Thundercats toys were made by LJN, the Silverhawks toys were made by Kenner. Not a problem in itself, but it ended up being a shame as the toys were completely out of scale with each other. It would have been cool to have a unified scale shared by both lines since the shows were so similar in animation and voice talent. Oh well, another lost opportunity in the toy history books! 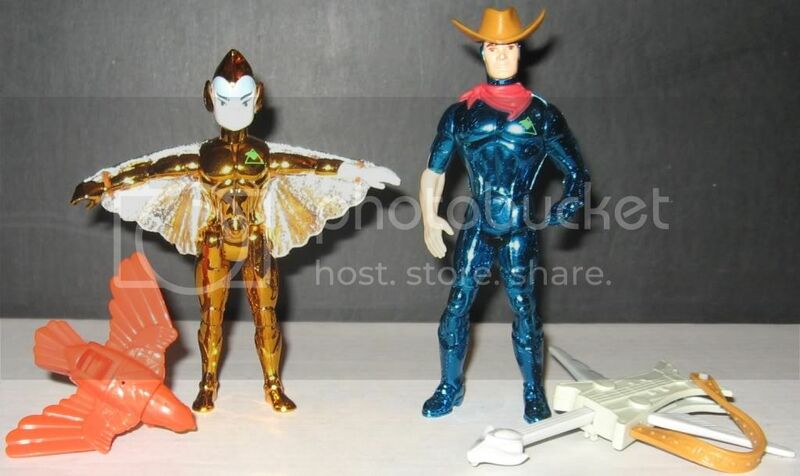 Each Series 1 figure of the Silverhawks came with a "bird" of some kind. 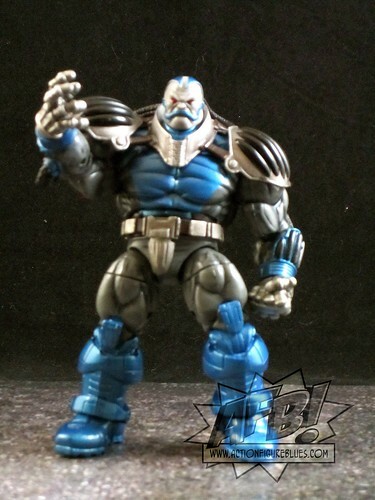 This was dropped in Series 2 with some figures such as Windhammer and Ultrasonic Steelwill. Each figure had an action feature as well, some better than others. There were also several "kid-sized" birds and vehicles. ANYWAY, on to the goods! 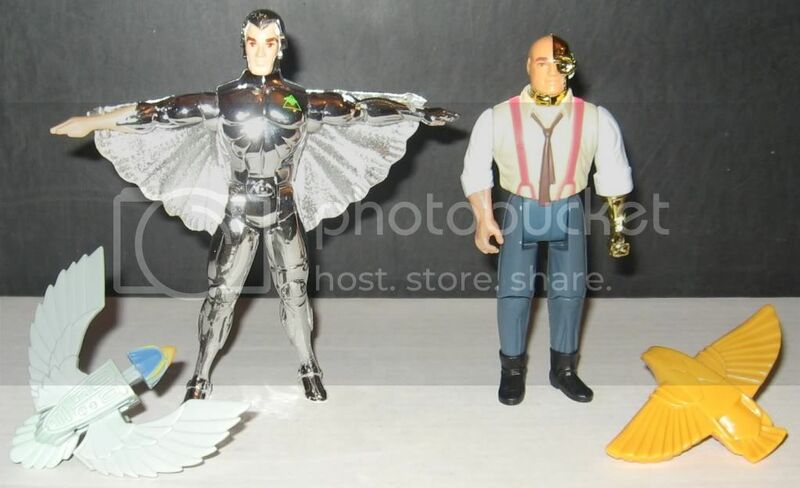 Over the years, I've gotten everything I wanted from the Silverhawks line. I never really liked the villians on the show and some of the figures were pretty bad, so I just got the ones I wanted. As for the Hawks themselves - I got 'em all. Windhammer, Buzz-Saw with Shredator and Hardware with Prowler. 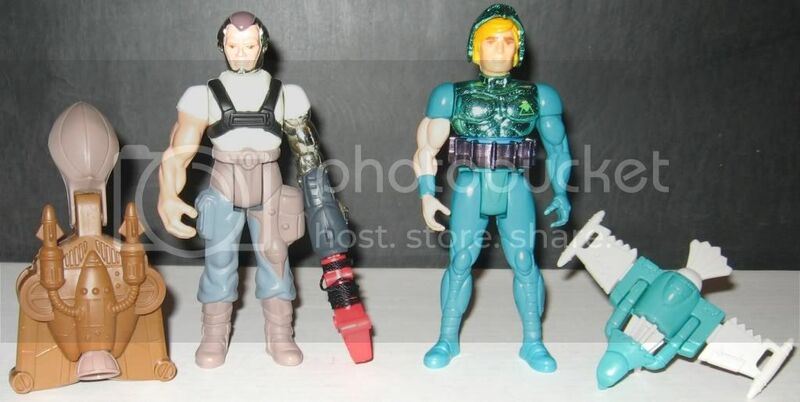 Windhammer and Hardware are Series 2, while Buzz-Saw is Series 1. To check out some additional photos of these toys and their accessories in use, check out the Toys I Grew Up With Board at the AFB Forum. Many thanks to Stars for another great trip down Toy Memory Lane! You can enter the June AFB Comment of the Month Contest by commenting on this post! 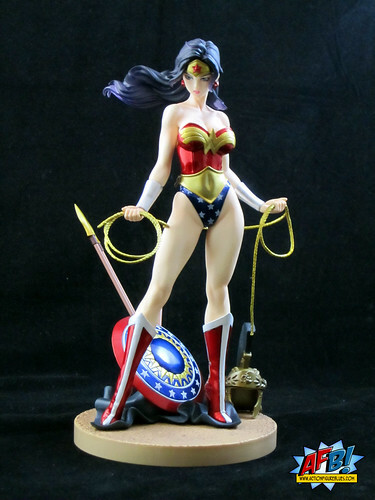 Kotobukiya's Wonder Woman takes the Bishoujo line to new heights! After enjoying Kotobukiya’s first release in their DC Bishoujo Statue line, Batgirl, awhile back, I took a breather from the line, as the second statue, Catwoman, didn’t really feel like a “must” to me. 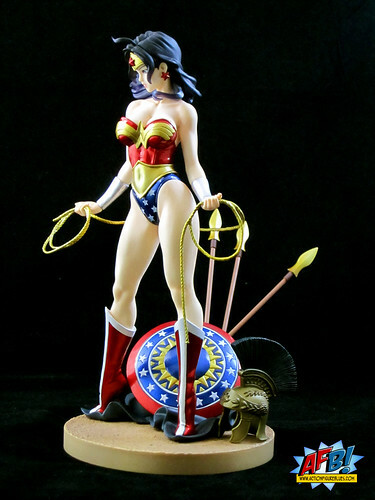 I’m back with bells on for the Kotobukiya DC Comics Wonder Woman Bishoujo Statue , which in my opinion outshines any of Koto’s other Bishoujo pieces and stands in a class of her own. This piece has been out for a little while, but mine has been caught up in a snafu of a big pre-order I did with an e-tailer that I’m no longer using for a number of reasons, and so I had to wait longer for her than I would have liked. I had some reservations about the DC branch of the Bishoujo line after the Batgirl release, and I knew that Wonder Woman was going to be a clear indicator to me of whether or not I’d keep collecting the line. Koto has most certainly put any doubt of my continued DC Bishoujo purchases to rest with this utterly beautiful piece. While DC Direct’s Ame-Comi line has definitely grown on me for it’s manga-esque re-stylings, I really do love Koto’s much more literal anime interpretation of our heroines. Wonder Woman’s sculpt is outstanding. I had some issues with the length of Batgirl’s lower body and legs, which seemed a bit long for the rest of her body, but Diana is beautifully proportioned. I’m very appreciative of Wonder Woman not being given a cutesy pose - it’s worked for some of the Marvel ladies, but it really wouldn’t suit Diana. Her pose is gracious yet powerful as she readies her magic lasso. Her lasso comes as a separate piece, and the way that it attaches into her hands is a very clever bit of design. I haven’t had any issues with paint on the Bishoujo pieces, but I was a bit dubious of some of colour and texture choices on the Batgirl piece - some of the metallic blues were a bit much for me. There is some use of metallic paints here in the reds in Wonder Woman’s costume and shield, but it’s a beautiful, rich shade and the reflective red adds some lovely depth to the piece and contrasts beautifully with her raven black hair and alabaster-looking skin. It’s a very striking colour scheme supported by a beautiful paint job. The base for Wonder Woman is a big hit with me. I like bases that make sense to the character, and you can’t get better than this. Diana stands atop a plain stone-looking disc with Amazonian warrior’s gear behind her. Her cloak and shield are fixed to the base, while her helmet is a free standing piece. Three spears come separately and fit into the back of the cloak to complete a fantastic diorama. It’s a beautifully detailed backdrop that adds to the overall piece without distracting from the main attraction - the figure itself. I continue to be blown away by the quality of this piece. It’s a huge leap forward for the Bishoujo pieces. Wonder Woman certainly deserves the deluxe treatment, but I do hope that we see this level of quality going forward! 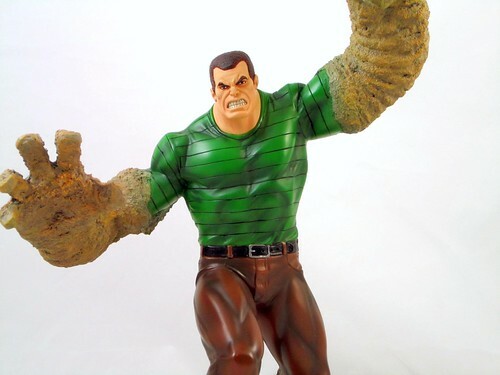 I’m certainly leaner towards larger scales of collectables these days, but there is something about Hasbro’s Marvel Universe 3 ¾” line that keeps me coming back. It isn’t the consistent quality of the figures, rather it’s the huge array of characters that Hasbro is bringing to the line. My collecting habits are generally about team / universe building, and this line definitely feeds that interest! 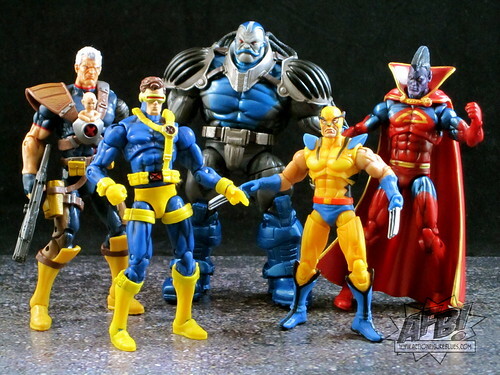 Tonight I’m reviewing Wave 13 of the Marvel Universe line, which includes Cyclops (Jim Lee version), Cable, Gladiator, First Appearance Wolverine and Apocalypse. While there are some individual niggles with some of these figures, this is overall a very strong wave which makes some great additions to the line. The pick of the wave for me is Cyclops. We’ve had a couple of Cyke versions in this scale, but this one in his Jim Lee-styled gear is the strongest by far. This figure has some new elements - in particular much better ankles which have side articulation as well as front / back. This allows a great deal more in terms of poseability and I hope it becomes a standard in the line. The real highlight of this figure, however, is the headsculpt. These 3 ¾” are not always stellar in this category, but Cyclops is a very happy exception to this. It’s very detailed and a spitting image for his comic look. It’s very ably backed up by a great paint job - definitely my favourite of the wave! The only mark against Cyclops is his belt and harness. It’s been sculpted separately, which has the potential to be a nice touch, but it isn’t a great fit and tends to ride up. I suppose adding this as a separate piece was cheaper than adding it as a fixed part of the sculpt, but it does detract ever so slightly from the overall look. Cable comes in two packouts - one with Baby Hope in her X-Harness, and one with out. Mine is the Hope-ful version, but I am actually leaning towards displaying him Hope-less simply because the little sculpted baby looks pretty ridiculous. It’s a great touch and references a significant storyline, and the look of the baby is consistent with some comic appearances (like the cover of the most recent Cable #1) but the end result is just a tad goofy looking. Thankfully the figure does come with a swap-out X symbol that Hope can be removed. Creepy Plastic Baby aside, this is a very solid figure with some very nicely sculpted custom pieces and attachments. His headsculpt is a little bit lacking in detail but works well, and all of his attachments fit snugly. This is a brand new buck for the line which gives us a taller muscular male - let’s hope it’s used to bring us some more new characters to the line! 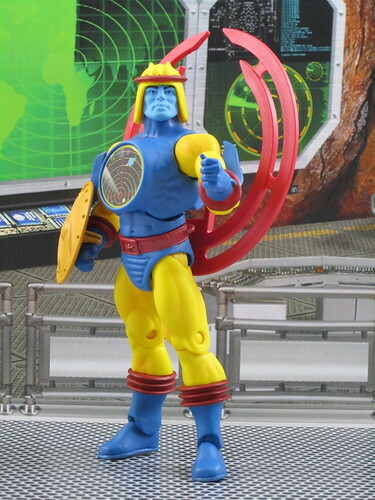 Gladiator is a very welcome addition to the line - I like getting the lesser known characters and I’ve always had an interest in Kallark since reading the death of Jean Grey - the first one - back in the day. He’s had the limelight a bit lately with Realm of Kings and Annihilators, and definitely belongs in this line. The standard sculpt works well with custom cape and mohawk to good effect. Unfortunately, Gladiator is let down by the paint job on his face. There are two tones of purple here which may have been used for contrast, but the lighter purple is so light that he looks like he’s contracted a Shi’ar version of Vitiligo, the condition where the skin loses its pigment. The rest of the paint job is stellar, so the face crud really is a shame. I’m still glad to have Gladiator in the collection, but he definitely loses marks for the paint issues. First Appearance Wolverine is actually a fairly good representation of Wolvie’s debut in Incredible Hulk #181, but he’s still the runt of this litter. His face is a good attempt at the FA look, but the lines aren’t quite defined enough. He is at a good scale in comparison to the other figures, and that’s about the best I can say about him. Hasbro has been fairly consistent in doing the oversize characters very well in this line. Apocalypse definitely falls into that category. He looks great, and nothing lets him down in terms of sculpt or paint. I love his groovy super-despot shoulder pads! The only thing I’d suggest as an improvement would be an open mouth to avoid the clown-lips sort of look that Apocalypse can fall victim to. He has a suitably evil expression otherwise which saves him from losing any marks. He’s a great figure nonetheless, and a fantastic addition to the collection. This wave has a nice symmetry to in in terms of theme, and yet delivered some nice new additions to the MU line at the same time. This sort of design - and this overall level of quality - will see me continuing to collect Marvel Universe for some time to come! DC DIrect's Classic Star Sapphire Busts in to AFB! I have been very impressed with DC Direct’s consistent output in the bust arena. The Women of the DC Universe Bust line is one of the longest running. We’re now in the third series of the line, which is based on Amanda Conner’s art. The latest in the line that I’m reviewing is the classic version of Green Lantern’s foe / flame Star Sapphire. She’s had a rather sexed-up redesign in recent times, but there’s always a place on my shelves for the classics, and this is a very welcome addition to my shelves. Classic Star Sapphire is a natural match for Conner’s artistic style. The sculpting effort here is very straightforward and the effect is full of classic goodness. The combination of Conner’s cartoonish style, the smooth textures of the sculpt and the use of matte paints combine for a very effective final product that makes the bust visually hark back to Star Sapphire’s early appearances. One of the things that I love about Conner’s designs is the element of humour they often contain. This one has a big nod to Star Sapphire’s role in the Green Lantern mythos - she’s wearing what you would assume is Hal Jordan’s power ring, and showing it off like one might a shiny new engagement rock. 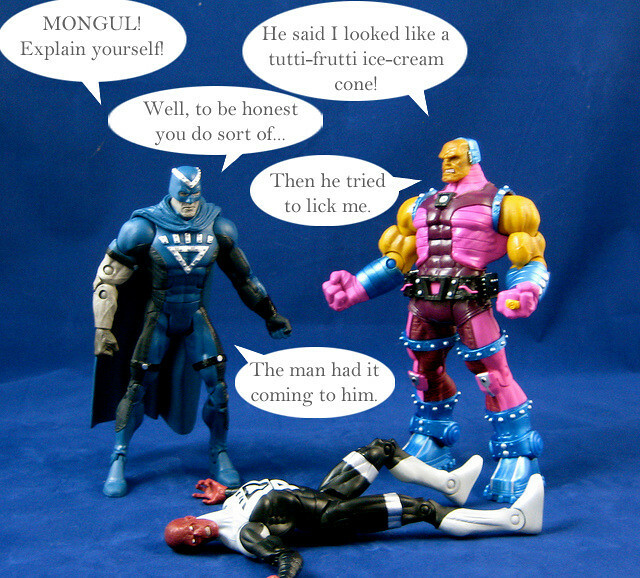 This is Star Sapphire at her classic - and craziest - best. The base is a sapphire burst, which works because it’s made of translucent materials. It really lifts the entire piece to another level, and makes my point about why I thought the yellow “energy” on the recent Sinestro bust needed to be translucent. While Sinny looks like he’s plunging into a vat of mustard, Star Sapphire looks bathed in energy, and the translucent material is a great counterpoint to the matte paint on the bust itself. It’s nice to see new characters enter this line, as the big names do get repeated for each new artist. This particular piece is a real treat not just because of the uniqueness of the character, but because of the use of her fantastic classic look. A true winner in my book! With all of the changes happening at DC, there is obviously a great deal of uncertainty about the future of DC Direct. I do hope that they don’t completely end their statue output, as lines like these have brought us so many gems over the years and there is still so much more of the DCU to explore before they finish. Here’s hoping! MOTUC adds Catra and Sy-Klone to the mix - watch the fur fly! 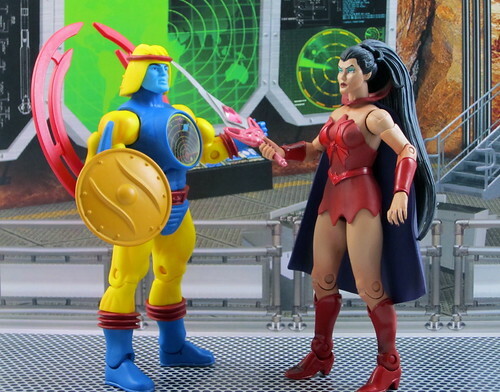 Mattel’s Masters of the Universe Classics line continues to pump out some great additions to their expansive revisit to the He-Man and She-Ra worlds, and tonight I’m looking at two recent additions - Catra and Sy-Klone . I’m very happy with both of these figures, with one or two minor comments. Catra is an exciting addition not only to the line-up of MOTUC’s female characters, but also to the Princess of Power stream of the line. Catra was originally imagined as She-Ra’s main nemesis, but ended up working for the Horde, although on her own terms. My Catra didn’t get off to a stellar start, as she was the figure that arrived in the horribly battered padded bag and mailer box that I posted about here. I really don’t know why Mattel thinks this sort of packing for international shipping is acceptable, but I won’t start another rant here. Thankfully, I’m an opener and the figure itself wasn’t damaged, so I didn’t have to try to chase a replacement. 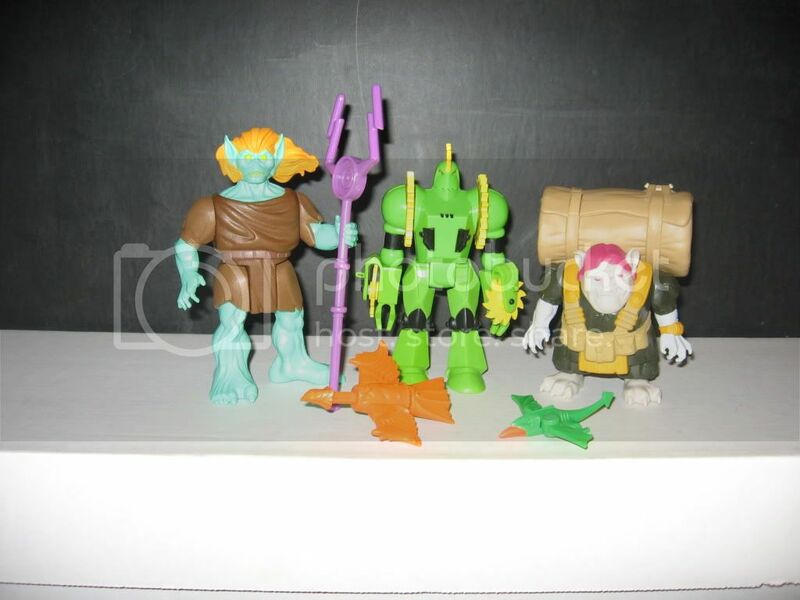 I like the MOTUC basic female buck. It’s nice and solid, especially in the upper arm area which is a real deficiency of the DCUC females. This is a very nice use of the basic buck with some custom sculpting for her hands (with claw like nails), bodice, collar, cape and boots. Her head is a real treat with a huge sculpted ponytail. The combination of the cape and ponytail do make her a bit hard to balance, and this isn’t helped by the loose ankle joints that seem to plague so much of this line, but she can be posed with a bit of effort. Catra comes with a bucketload of accessories. For starters, there are two different helmet options - a silver cat styled version and her more memorable (to me anyway) red version, which is what I’ll be displaying her with. They are both very well constructed, but both sit on top of her eyebrows, which is a bit of shame, as obscuring her eyebrows takes away the villainous look on her face, since her mouth is sculpted in a neutral position. Catra also has a range of weapons, including a pink sword with a cat face base and a shield. The one I’ll be displaying her with, however, is her groovy whip, mainly because it’s distinct from other MOTUC accessories. It does have a comb as a base, which I assume is a nod to the original figures which may have had rooted hair, but I’m ignoring this “girl’s toy” bit because the whip is quite fun and puts a different look on the MOTUC shelf. While this is really an excellent figure, there’s one distraction and one disappointment. The thing that I find distracting is Catra’s headsculpt. There’s nothing wrong with the quality of it, rather it’s her uncanny resemblance to the Wicked Stepmother from Cinderella. I’m sure it’s unintentional, but it’s a tad freaky! The disappointment is the paint job on Catra’s arm and legs. Her knees and upper arms are reddish in colour, which makes me wonder if it’s a beat of leaked spray from her bodice. The end result is that she looks like she’s tried to cut costs on her spray tan and ended up with an uneven job as a result. It definitely wreaks havoc on the figure’s QC marks. In the end, there’s a lot of other things happening visually with this figure which distract the eye from this issue. I’ve only seen my Catra, so I have no idea if this is across the line or if I just got a “special” one. Sy-Klone is a very eye-catching figure due to his somewhat garish colour combination which is totally faithful to his original look. Sy-Klone was introduced in 1985 right at the end of the MOTU animated series, and while I do remember seeing him on the pegs as a kid of fifteen or so, my minimal He-Man collection had stopped growing by then. The bright blue skin and yellow gear are very hard to forget! The figure itself is a pretty straightforward adaption of Sy-Klone’s original figure, but his accessory set adds something new to the mix which is a nod to the 200x version. Along with a fairly standard shield, Sy-Klone comes with a very large red attachment that fits in his back and represents his tornado-style powers. This inclusion is a nice way of combining the classic with the newer look, and to me it’s the best of the bunch, as I didn’t really like 200x Sy-Klone’s sphinx-like styling. I realise that the original Sy-Klone re-used the He-Man head, and while that’s been done here to be faithful, I do think Sy-Klone could have used a new face sculpt just to give him a real sense of something new. It’s the one thing I’d improve about this otherwise very enjoyable figure, but I realise it’s a stylistic choice. Both Catra and Sy-Klone look great in my MOTUC display, which is taking a more promiment place in my collection room as the MOTUC world grows. I’m already looking forward to what the 2012 Subscription will bring - as long as it doesn’t come in mailer bags! Thanks to everyone who voted for the ultimate winner of our Toy Lines! Caption Contest. It was hard enough for me to choose the winners of each of the four rounds, so handing over the choice to the fans was a big relief! It was tight there for awhile, but in the end, one entry ran away with the prize with just over 50% of the vote. Please give a warm round of applause to our Toy Lines! Overall Winner - bubbashelby! As our Toy Lines! Winner, bubbashelby will receive an unopened set of Masters of the Universe Classics Eternian Palace Guards. Bubba - pls send me your postal address at the AFB Forum! You can this at the AFB Forum, and you can comment on this post to enter the June AFB Comment of the Month Contest! Stay tuned for the next installment of Toy Lines! Bowen Designs Sandman stands above the crowd - on a strong shelf, please! As I said in my last post, I have been spending more of my collecting budget on statues of late, and not many of my recent purchases have excited me as much as tonight’s review subject. The Bowen Designs Sandman Full-Sized Statue is a truly impressive piece! If I had to choose my favourite Rogue’s Gallery of any superhero, I’d have to go with Spider-Man’s. Batman and Flash’s archenemies come a close second and third, but there’s something about Spider-Man’s baddies, especially the Sinister Six, that really thrill me as a reader. Any classic story involving the Six or any of its individual members is guaranteed to be a winner. My favourite of all of the Spidey villains is Sandman. He has an Avengers connection which would automatically make me partial to him, but I was a fan long before that. As a comic reading kid I was very taken by his powers, and his ability to be a very serious threat when written well. I also love his classic look of the green striped shirt and the brown trousers. Don’t ask me why on that one! The Bowen Designs version of Sandman is nothing short of spectacular. This is a Kucharek Brothers sculpt, and as usual they’ve given it the deluxe treatment. We get a great display of Sandman’s powers in this design. 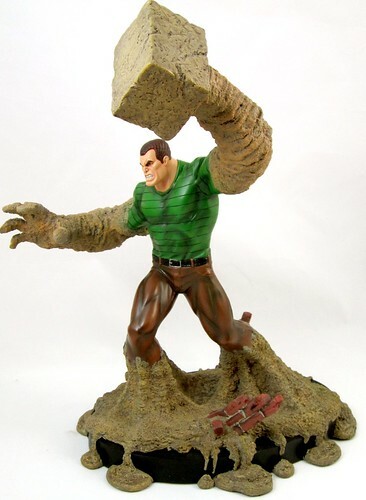 His right hand has been transformed into a large sand fist, while his left hand is in block-style hammer form. Meanwhile, his legs are transforming to large pillars of sand with sand dripping off the base. 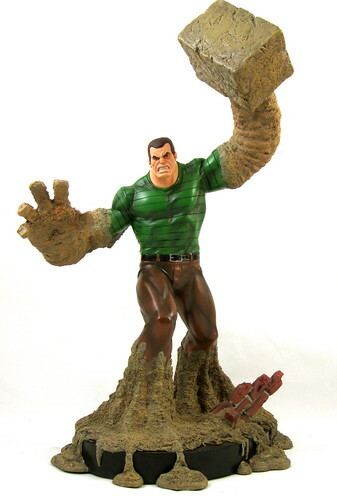 Sandman is lunging forward in attack, making this a very dynamic statue that looks fantastic from every angle. The textures in this piece are amazing. I know very little about the sculpting process, but I can’t imagine that designing something to look and feel like sand is terribly easy. There are different colours, textures and sheens within the sand areas, from the very rough sand of his right hand to the smoothed surface of his mallet fist to the wet, sloppy look of the sand that is dripping off the base. The result is breathtaking. I haven’t been 100% satisfied with all of the paint work coming out of Bowen lately, so it was a big relief to see that the paint job on this piece doesn’t let the amazing sculpt work down at all. There is a nice sheen to Sandman’s clothing, which provides an excellent contrast to the sections that have turned to sand. The colours are classic Sandman colours, making him look as though he’s leaping right of the page of a classic Spider-Man comic. His face is very nicely painted, with those ever-tricky pupils the same size and smack dab in the right place. Two things to note: first off, this statue is extremely heavy. It needs a very secure shelf to rest on - I’d never risk putting it on glass. The second point to be aware of is that this statue is a shelf space hog. The base is very deep and really only just fits into a Detolf - bottom shelf only thanks to the weight. It’s not as wide, so there will still be room on the shelf for a small base Full-Sized statue and perhaps a bust. I have Sandman’s Sinister Six colleagues Electro (FS) and Vulture (Mini-Bust) keeping him company, and they fit fine, but there’s no room for more. I’m not pointing this out because I have any complaints about the space this statue takes up - it really is quite a beauty and deserves all the space that it can get in your display. It’s simply that buyers do need to be committed to the character as he’s not going to be a wallflower (shelfflower?) in your display - he’s going to be a dominant force! I hope that Randy Bowen can keep the Kucharek Brothers busy with lots of Marvel projects - they consistently produce some of the most interesting and complex work out there - I’m very much looking forward to reviewing their Bowen M.O.D.O.K. shortly! In the meantime, I’ll be very content to look at their outstanding effort with Sandman sitting safely on a secure bottom display shelf! Also - don’t forget to cast your vote for the overall winner of the Toy Lines! Caption Contest! You may have noticed that the logos for both the AFB Blog and the AFB Forum have had a makeover! I've been thinking of giving the sites a spruce up for awhile, and started by doing some cleaning up and redesigning of the body of the blog at the beginning of the year with help from our friend dozymuppet, as I am moderately HTML-disabled. Once I'd done that I had an idea in my mind of a new logo that might suit the new look. I have many skills, but when it comes to logo design and all that graphic-y stuff (note the technical language) are not in my skill set, so I rely on the skills of others, which is just one of the reasons I keep company with a wide range of talented folk such as the capricious Coffee Joe and the bombastic Burn, who respectively designed the last two fantastic incarnations of the AFB logo. The idea for the new logo crystalised in my mind when I had my good and extremely talented friend Matt "Mirthquake" Orsman do one of his famous "Mirthtoons" of yours truly (check out Mirth's Facebook Page to see more of his work). It was initially for more of a lark than anything, but once I saw it, I realised how great it would looked tagged to the end of a new, Mirthquake-designed, AFB logo! It didn't take Mirth long to whip up the amazing treat you see above, alongside the forum logo and the smaller version in this post. Adding the Mirthtoon to the logo is a great way of clearing up any confusion that's been caused by my online name and my real one. I chose "Andy" as an online name many moons ago because it was a derivative of my surname, but as so many people have come to know me by that name, they often get a surprise when I sign off an email or message as "Scott". Now you can see it's all the same me! I'm over the moon with the great job Mirth has done, and I hope that you like the change. Mirth does his Mirthtoons for hire, and you can get in touch with him through his Facebook page above if you'd like your own. He's a real talent! Let me know what you think about the new AFB look! You can discuss this at the AFB Forum, and you can also comment on this post to enter the June AFB Comment of the Month Contest! 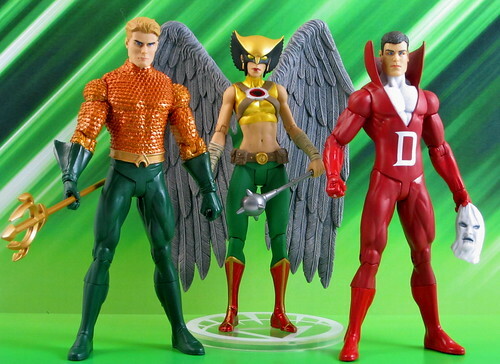 Tonight I’m reviewing three of the four figures from Wave One: Aquaman, Deadman and Hawkgirl. I decided to leave the Green Arrow figure on the shelves since I just paid a good deal more for the DCU Online Statue of him in exactly the same gear. I’ll start with Aquaman as he’s my favourite character of the bunch. I’d love to say he’s my favourite figure of the bunch, but there’s a couple of things holding him back. On the positive side, his orange scales are very nicely done and stand out thanks to a shiny paint job. I don’t mind the costume redesign - the collar certainly modernises his classic look. I’ve complained before about DC Direct moving from flesh coloured paint to flesh coloured plastic. The flesh coloured plastic seems to have been used on this figure, and in my opinion it suffers as a result. There is a lack of depth that results in the absence of paint on the face, and there’s something a bit off about the finish. It’s obviously a cost cutting measure, and it’s an irritating one. 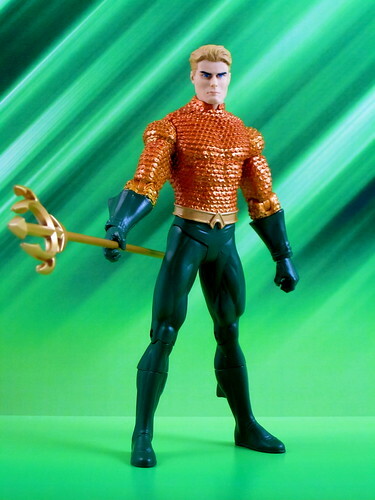 The other issue I have with Aquaman is that the headsculpt doesn’t really capture the character for me. For starters, he has dark eyebrows which draw too much attention to them - does DCD know something we don’t about Arthur not being a natural blond? The result is he ends up looking much more like Superhero Ken and much less like Aquaman. I’m still glad to have this figure, for no less reason than to stand alongside the upcoming Brightest Day Mera figure, but I do feel like the figure itself could have achieved a bit more. 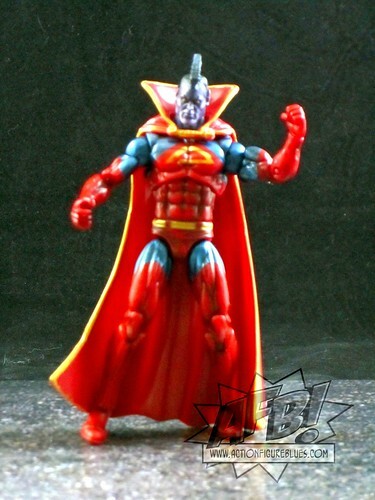 Deadman is an interesting contrast to the lanky version that was produced in the DC Universe Classics line. He’s more of a standard build here, which fits with his portrayal in the series these figures are based on. While the DCUC version has an open-mouthed scream sort of expression, Brightest Day Deadman looks like he’s had his lips sewn shut. Owie! All this to say that this figure stacks up differently to previous plastic incarnations of Deadman, but it’s a very valid and workable interpretation of the character. 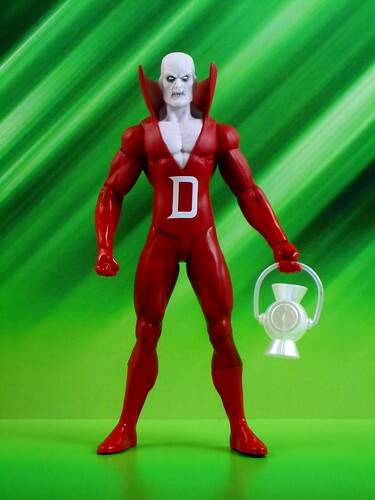 Deadman has a nice set of accessories - the kind that I’d like to see come with a 6” figure at this price point. He comes with a White Lantern, an unmasked Boston Brand head and a Deadman mask for him to hold when in unmasked / alive mode. I’m sorry to report that while the White Lantern may be the most powerful of the lot in the comics, the handle on the DCD version falls off just as easily as all the other colours! The real stars of this set are the unmasked Boston Brand head and limp Deadman mask. The Boston head has the same issue as Aquaman in terms of the flesh-coloured plastic, but seeing as Deadman spent a good portion of Brightest Day alive (er... Aliveman..?) this swappable head has some storyline merit. I would have preferred the head to be a bit closer to the way Boston was portrayed in Brightest Day - starting with darker hair instead of the brown shown here. The mask that Boston can hold in his left hand is a real treat - the face on the mask is sculpted on, and the flow of it in Boston’s hand is pretty amazing. This is the version that’s going on display in the Andy household, that’s for sure! A very nice touch from DCD! The best overall figure for me in this lot has to be Hawkgirl. 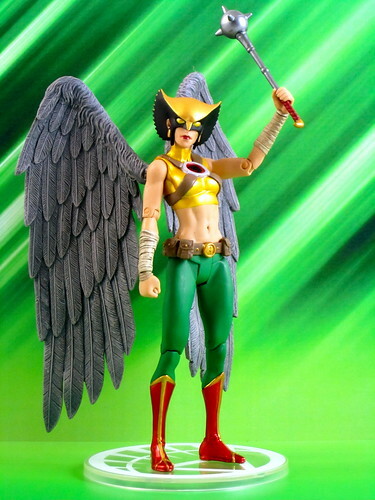 There have been other DCD Hawkgirl figures, but this one is the best by far, and has the added bonus of being Shiera Sanders under the Hawkgirl mask! For starters, DCD has designed a very good set of wings in this particular figure. While the hyper-extendable wings that came with the original DCD Hawkman & Hawkgirl figures still take the cake, these wings are a good improvement over all of DCD’s recent efforts. They have a much easier means of attachment to the figure, requiring only some simple pressure to insert as opposed to the boil and pop I had to perform on my JSA Hawkgirl. This figure also has the best balance of the recent winged figures. She still needs the base to stand up, but on the base she can stand up straight as opposed to having to lean forward awkwardly to avoid toppling over. Apart from these successes, Hawkgirl just plain looks great. The simple tweaks to the Hawkgirl costume in her Brightest Day redesign, particularly the black on the sides of her mask, are very effective, and they make for a striking figure. There’s a very nice sculpting job here, supported by a good paint job. I was very sorry to see Shiera not survive Brightest Day in this form - perhaps the DCNu will be an opportunity for her to return! These figures may be the last we see of characters from the DC Universe that’s soon to be no more, but I’m going to make the most of them. There are some first-time in 6” characters coming up in the later Brightest Day waves that I am still very much looking forward to - Mera, Jade, Hawk & Dove and yes, even the new Aqualad! While there were a few niggles with these figures, if these first timers turn out as well as this first set, they’re going to very nice additions to my little plastic version of the DCU! You can see more pics at Facebook, discuss this at the AFB Forum, and you can comment on this post to enter the June AFB Comment of the Month Contest! Also - don’t forget to cast your vote for the overall winner of the Toy Lines! Caption Contest! Jesse Quick and Duela Dent join DC Direct's Ame-Comi Family! And now for something completely different - it’s time to look at the latest additions to my DC Direct Ame-Comi PVC Figure Collection - Jesse Quick as the Flash and Duela Dent as the Joker. First up - the names of these pieces. I’m not sure why Jesse Quick and Duela Dent, who each are characters in their own rights, needed these extra tags. I don’t know that adding “as the Flash” to a female figure is going to cause more people to buy it. Obviously DCD did, so perhaps I’m wrong. As someone who knows both of these characters quite well, it seems a bit of a slight, that’s all. Thankfully, that’s the main note of concern here, as DC Direct has done a great job with both of these statues, bar a few niggles. Jesse Quick is fun addition to the Ame-Comi line. It's nice to have a member of the Flash Family in the Ame-Comi fold! I like the pose, which is fitting for a speedster but not the running pose one might expect. I love the way that her hair ends in a lightning bolt shape at the back, and her sneakers are brilliantly detailed - more lightning bolts included! Jesse has a removeable visor made of translucent yellow which I’ve decided to leave on in the display. It does cover up a bit of her face, but I’m not totally worried about that. The only thing I’d change about Jesse is her facial expression. Whether it’s her large, round eyes or her somewhat pursed mouth, she looks a little too much like a blow-up doll for my tastes. This statue has a very nice paint job, including reds that you might think don’t go together but in fact do work on this piece. Like the rest of the new Ame-Comi pieces, she has the smaller base which means the new pieces take up less room - a big plus for this collector! The steampunk look chosen for Duela Dent is fabulous. It’s a bei of a side step from the more straight anime stylings of much of the rest of the line, and I quite like it. The big hits with me are the clown make-up and her groovy spectacles. I like the different purples that are used here, especially the shiny purple on her trousers. The translucent green frills on her sleeves are also a fantastic touch. I have one minor and one major complaint about Duela. The minor issue is that she’s looking a bit too far down, and unless you can place her on a higher shelf you’re going to be looking at the top of her hat and not her face. The major issue is that her right hand is not designed to hold her cane, which means that if you want to display it with the statue, it has to dangle from her wrist via the included plastic strip. Either the cane was an afterthought, or the sculptor simply neglected to design the hand to hold it. Either way - it’s a dislike. One other thing to point out about Duela is that she is rather tall, and almost appears to be slightly out of scale with the other pieces in the Ame-Comi line. When you look her in comparison to the others, it’s partly her tip-toed stance, partly her hat and partly that her legs are quite long in comparison to her upper body. It’s not a big issue, but she does end up looking rather big compared to some of the earlier Ame-Comi pieces. For me, this line continues to go from strength to strength. The repaints of earlier pieces are giving collectors late to the game the chance to own them (I really must pick up that purple Catwoman) and completists more to buy, while the new characters added to the line are broadening the scope of the line’s character coverage. I do love it when we get characters that have never appeared as a collectable before! Next up for the Ame-Comi line will be Mera and Raven. I’m waiting for a replacement Mera as all of the Meras sent to my LCS (which is still my Canberra shop) arrived with their heads snapped off! Hopefully I’ll be reviewing more Ame-Comi (with heads!) soon. 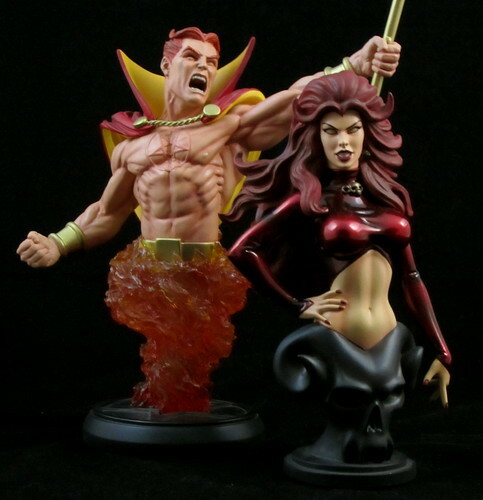 Bowen takes AFB to Hell with Daimon Hellstrom and Satana Busts! I try not to do too many multiple product reviews, as it’s nice to give each item the spotlight, but these two mini-busts from Bowen Designs are such a complimentary set that I’ve decided to break that rule so that we can all enjoy the hellish goodness (er.. what?) that Bowen has delivered. Please welcome Daimon Hellstrom, formerly known as the Son of Satan, and his sister Satana to the Bowen Bust fold! 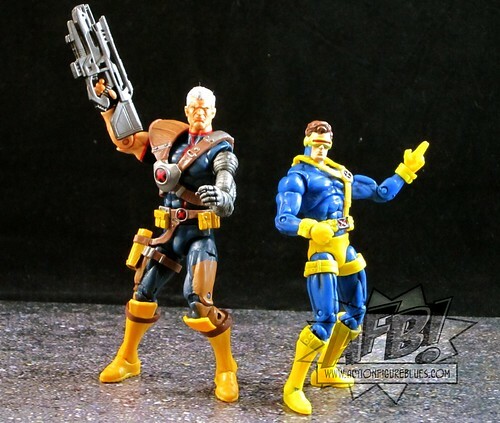 I’m going to start with Hellstrom as he’s the lynch pin of this pair and my reason for wanting to own the other. Way back in the ‘80s when I was given the box of old Marvel comics that cemented my superhero lovin’ ways, I got to know Daimon Hellstrom through quite a few issues of THE DEFENDERS. He was already off the scene in the modern Marvel comics of the day, but I’ve always had a soft spot for all of the classic Defenders characters from reading all of those comics at an impressionable age. My nostalgia has certainly been given a treat with this bust. I’d love a Son of Satan full-sized statue, but this expansive bust really is the next best thing. This piece has been done by one of my favourite lesser-known sculptors, Walter O’Neal, who was responsible for a few great Bowen pieces of years past, and also the Wonder Woman Vs. Ares and Batman Vs. Killer Croc Statues from DC Direct. He has certainly brought his A game to this piece! This bust is Bowen Busts at the top of their game. It has all the expressiveness and dynamism of a full sized action piece. 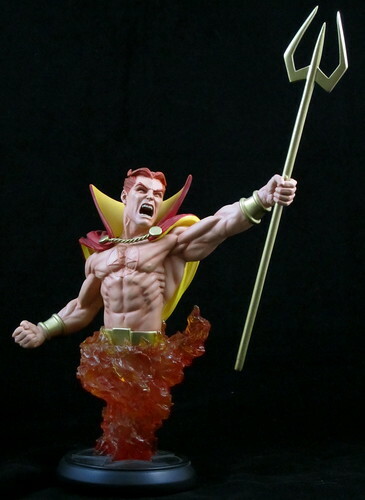 Hellstrom has been given a very powerful pose, with his left arm outstretched and his left hand holding his trident, which is a separate piece. His muscle definition and chest pentagram are beautifully sculpted, and his headsculpt is pure classic Son of Satan, complete with attitude. I really do like statues that have a definitive facial expression, and this bust certainly delivers in that area. I love the way that O’Neal has felt free to use Hellstrom’s cape without going for the flowing cape effect, as there is enough happening here without it. You can see the fullness of his cape bunched together at the back, so it’s still there, and that’s enough. All of this great sculpting and design is polished off with a perfect paint job to create a clear favourite for bust of the year. Sensational effort from O’Neal and Bowen! The only quibble I have with this piece is that due to it’s height, its rather incompatible with the older Hellcat bust, which has a very small base and so is extremely short by comparison. Ah well - Daimon and Patsy never really were on the same level anyway. (Sorry - I couldn’t resist). Bowen’s female busts have been a tad hit and miss in recent times. Thankfully Satana falls in to the “hit” category. She is beautifully sculpted by Mike Cusanelli, who has been working on quite a few Bowen female pieces of late. I’ve had some issues with some of his composition - he sculpts beautiful ladies but can fall short of creating a pose with energy, and while this bust has that issue to a degree, this is one of his better efforts. Satana’s hair is a particularly nice sculpting effort. Her beautiful, flowing locks are topped off by her hair “horns”, and it’s all very well done. Satana has sported a number of outfits over the years ranging from somewhat chaste to barely there. The choice of outfit here is a happy medium and it works well. Satana loses no marks in the paint department. I love the metallic edge to her outfit. It definitely helps bring life and depth to this piece. She doesn’t have pupils, which removes the risk of the wandering eye paint jobs that have been plaguing Bowen of late. Both of these pieces have fantastic bases. Satana rests atop a hellish looking goat’s head, but it’s Hellstrom’s plume of flames that really takes the cake here. I love the look of the translucent styled flames that Bowen often employs, and it is used to its best effect on this piece. These both are great additions to the Bowen bust fold. I have to say Hellstrom is right up there is the league of Bowen’s best efforts ever! I've said it before - one of the things I love about Bowen is their obvious love of the Marve Universe and their willingness to plumb its breadths and depths to bring us such great pieces. Here's to the future releases!